Mirrored by a decline in the number of terrorist attacks and incidences and the restoration of a semblance of law and order, Pakistan’s fight against terrorism has recently begun to be touted as a story of success. However, within the month of December alone, a number of developments occurred which question this assertion. There occurred a siege and attack by a mob of 1,000 people on an Ahmadi mosque in Chakwal, during which a 65-year old man belonging to the persecuted minority suffered and died of cardiac arrest. The Federal Minister for Religious Affairs Sardar Muhammad Yusuf also happened to present a “peace award” to apostle of peace and esteemed ambassador of inter-sectarian harmony Masroor Nawaz Jhangvi, who is now a member of the Punjab Assembly after winning the PP-78 Jhang by-election. Furthermore, flocks of people were reported to be drawing to a site at the outskirts of the capital which was revealed to be the grave of Mumtaz Qadri that is now being turned into a shrine. News of the interior ministry’s preparation of the draft of a law which seeks to give military courts, whose term expired on January 7, permanent status also did the rounds. Lastly, while Jibran Nasir struggles to get a case registered against Abdul Aziz for his declared allegiance to ISIS and for incitement of hate against Shias, pressure from the Sunni Tehreek led to the registration of an FIR and a spate of death threats against Shaan Taseer, son of slain governor Salmaan Taseer, for conveying Christmas greetings to Christians in Pakistan and expressing hope of redressal for those subjected to the blasphemy law. That these developments occurred within the span of a single month is an unsettling realization which also asks for the direction and narrative of Pakistan’s campaign against terrorism and extremism to be probed and reviewed. A concrete answer to the question and status of Pakistan’s fight against terrorism and extremism is found in Justice Qazi Faez Isa’s inquiry report into Quetta’s Civil Hospital attack of 9th August 2016. The 110 page report provides extensive insights into the “monumental failure to combat terrorism and perform basic protocols” especially pertaining to the National Action Plan. It mentions not only a lack of action against proscribed organizations, that have freely held rallies in Islamabad, but also a brazen “cavorting” by key government figures with the heads of these organizations, as was demonstrated by the meeting between the interior minister and Ahmed Ludhianvi of Ahle Sunnat Wal Juma’at. The report further makes mention of lapses, limitations and inadequacies in terms of the tools and methodologies used to investigate attacks; along with sheer negligence in “silencing extremist speech, literature, and propaganda” and the stark “shortsightedness” of the federal and provincial governments in thwarting terrorism and extremism. The report is an act of Qazi Isa’s professional integrity and bravery, but it is also a damning expose and indictment of the government, the interior ministry and the failure and façade that is the National Action Plan. The number of terrorist attacks and incidents in Pakistan may have registered a considerable drop in numbers but they are far from over. In fact, their focus in certain areas and upon certain communities remains as forceful and fatal as ever. The past year alone remains relevant in illustrating this. In 2016, a Shia majlis was attacked in Nazimabad, killing four. But denial about targeted killings of the beleaguered Shia community persist within the wider narrative of the population. Quetta was also frequently besieged by tragedies which have ceaselessly continued to devour and devastate the city. In August, the blast at the Civil Hospital killed an entire generation of the city’s legal community, while the attack on the police training academy took the lives of 61 cadets and guards. In September, suicide-bombers targeted a mosque in Mohmand Agency, and an Imambargah in Shikarpur during Eid prayers. Earlier in 2016, the attacks on Bacha Khan University and Gulshan-e-Iqbal Park took place. The sites for terrorist assaults may have shifted to neglected and orphaned “peripheries” like Quetta and FATA, but the danger and threat persist. And they will linger as long as state institutions remain divided on the matter and continue to keep in place dubious policies and doctrines that bar an unequivocal commitment to counter extremism and terrorism in all tints and tones. This is no longer a contention but a judgement officially articulated and validated by Justice Isa’s report. On the other hand, the lifted moratorium on the death penalty, perhaps the only implemented measure of the much-hailed National Action Plan, continues to work in full force without any hindrance of transparency and accountability. According to the Justice Project Pakistan, an estimated 400 prisoners have been executed since the lifting of the moratorium, pulling Pakistan to the position of the third most prolific executioner globally. The JPP also states that a slim 16 per cent of the executions carried out since December 2014 were tied to charges of terrorism, while the rest involved juveniles and disabled inmates. The mockery and sham of justice continues at the courts and the gallows. Moreover, the attack which gave rise to a national sense of urgency in dealing with terrorism has yet to be investigated. The APS attack, which the so-called “paradigm shift” and the National Action Plan were predicated upon, has actually been the subject of a concerted and brazen campaign of silencing and harassment which has been directed at the parents who have been tirelessly and bravely demanding an inquiry and investigation into the ghastly attack. Two years on, an inquiry into the APS attack has not been ordered but actively suppressed. In light of these realities, as Pakistan steps into 2017 it is necessary to proceed with cautious optimism and realize that the calm engendered by a decline in terrorist attacks is relative and temporary as long as the roots and the many manifestations of the menace are not tackled. This relative calm should not engender a sense of complacency among the federal and provincial governments whose approach to the issue already comprises craven surrender, prevarications and papering over the problem. The scourge of terrorism and extremism doesn’t only need to be subdued but stifled and strangled to an end. There exists a dire for a fundamental change in the framework, direction, orientation and agendas of the state and the actors steering them. Neither declarations, nor a rhetoric of resolve and programs like the National Action Plan would suffice. Templates and infrastructures like the NAP can only aid and facilitate actual implementation on ground which demands political will, courage, vision and resolve that repudiate political expediency, cavorting, patronizing, pacifying and pandering to militant, sectarian organizations and the many faces and forms of extremism. Until then, Pakistan’s success against terrorism, drawn from a decrease in the number of attacks, must be recognized as partial success in a war with multiple battles and fronts, a war still far from a conclusion today. *Originally published on The Nation Blogs. Pakistan may have a plethora of problems, but it definitely has no shortage of a peculiar set of solutions to deal with those when the need arises. Recently, photos emerged of a black goat being slaughtered at the airport tarmac in Islamabad right beside a Pakistan International Airlines plane. PIA has now reportedly launched an investigation into how and why a goat and butcher’s knife were brought to what was a restricted zone. While at first it seemed that the chief national policy, Allah de hawale, was in action, it was later revealed the slaughter was done as “a gesture of gratitude” in light of ATR operations being resumed. Religion pervades ever corner of Pakistani society and culture. And the state’s ample usage of religion has a long and vivid history which thrives even today. Therefore it is hardly a surprise that references and supplications to the divine feature at all levels in the country, from Pakistani courts to airport tarmacs. What is unsettling, however, is the conception of religion in this regard. Divine power and fate are frequently invoked, but to what purpose? Often to shift the burden of responsibility that is tied to human agency. Perhaps the slaughtering of the goat was a well-intentioned act by some PIA employees, and genuinely a gesture of gratitude or a prayer for safeguarding flights against further accidents. And its occurrence certainly does not mean that normal security, safety and upkeep procedures were not being followed, however the symbolism of the act is striking. No number of goats will be adequate for slaughtering to save PIA from its problems, which lead force such expressions of relief and gestures of gratitude in the first place, if a thorough inquiry and reform is not conducted pertaining to the airlines’ lengthy list of problems and inefficiencies which have made the national airlines the subject of numerous jokes and a source of constant embarrassment to the public, and a source of constant fear to those who chose to fly with it. In short, the exercise of human agency, effort and diligence is wholly necessitated – that God has given precisely for its application. The importance of Gormez’s message resonates: ‘divine power’, ‘fate’ and hopes for “divine intervention” and “protection” should not be used as exculpatory devices; as escapes from and substitutes for human responsibility; as excuses for indifference, inaction, and as excuses for the pandemic of human incompetence which we parade all over Pakistan. While the fuss and furor over a certain journalistic report violating national security raged, lesser attention was lent to the crux of the report itself: the reemergence of the government’s fresh resolve to tackle militant outfits and the stern communication to the military leadership of the need to be on the same page for it. Voices from within the parliament have also been emerging against Pakistan’s problematic position, shady instruments and assets of foreign policy and national interests, and their ramifications. Aitzaz Ahsan took to bluntly criticizing the government for its unsuccessful imposition of “restrictions on non-state actors according to the National Action Plan”, as did PML-N lawmaker Rana Muhammad Afzal who is reported to have questioned the continued “nurturing” of Hafiz Saeed by the state. There should be little uncertainty or confusion about the repercussions of these policies on Pakistan which include a fractured social fabric, the loss of 50,000 lives, and a tattered international image. The negligible and indifferent global response to Pakistan’s latest crusade for Kashmir has also disclosed the country’s embarrassingly insignificant standing and tainted reputation on the international stage; which squanders even the scarce diplomatic support and capital the country possesses. While numerous conspiracy theories can be contrived and churned to which this deplorable situation can be ascribed, it is undeniable that Pakistan owes this mess to a suspect stance and strategy on the issue of terrorism, and an appalling state of foreign policy, that others are all too willing to make vigorous use of in pushing for its isolation. And domestically, what is there to see? Only a few days ago, a Shia majlis was attacked in Nazimabad, killing four. But denial about targeted killings of the beleagured Shia community persist within the wider narrative of the population. Quetta has been besieged by yet another one of the tragedies which have ceaselessly continued to devour and devastate the city. 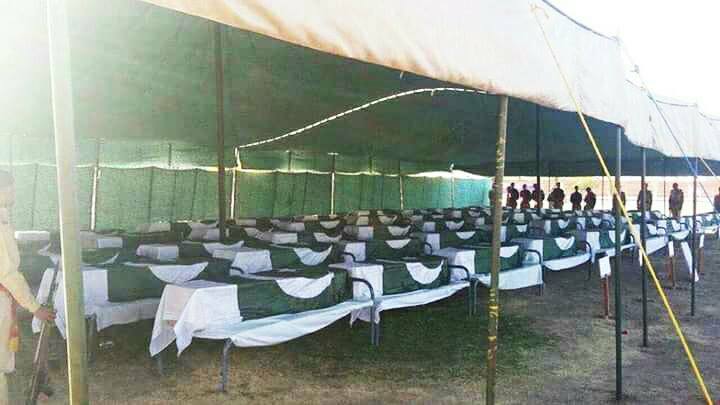 At least 61 cadets and guards have been killed in the attack on the police training college there. Much praise has been heaped on the military leadership for eradicating the scourge of terrorism and reestablishing a semblance of law and order, a perception certainly bolstered by the DG ISPR’s claims that the “military has completely cleared all terrorist hideouts in Pakistan.” But it would serve us well to brush our memory and remember that an attack in Quetta just this August killed an entire generation of the city’s legal community. In September, suicide-bombers targeted a mosque in Mohmand Agency, and an Imambargah in Shikarpur during Eid prayers. A few days ago, four Shia Hazara women were murdered after assailants opened fire at their bus in Quetta. Earlier this year, the attacks on Bacha Khan University and Gulshan-e-Iqbal Park took place. The frequency of terrorist assaults may have considerably slid down the scale, and the sites of these attacks may have shifted to neglected and orphaned “peripheries” like Quetta and FATA, but the danger and threat persists. And it will linger as long as state institutions remain divided on the matter and continue to keep in place dubious policies and doctrines that bar an unequivocal commitment to fight extremism and terrorism in all tints and tones. On the other hand, the lifted moratorium on the death penalty, perhaps the only implemented measure of the much-hailed National Action Plan, continues to work in full force without any hindrance of transparency and accountability. Earlier having delayed the execution of a mentally-ill 50 year old man by the name of Imdad Ali, the Supreme Court recently and outrageously ruled that schizophrenia cannot be considered a mental disorder, essentially clearing the way for his execution. The mockery and sham of justice continues at the courts and the gallows. The National Action Plan also came into rare force in April when the planned convention for the commemoration of the Okara peasants’ struggle was banned and more than 4000 peasants were charged under anti-terrorism laws. That demands for land rights by peasants now constitute terrorist offences violating ‘national security’ while those who incite hate, violence and maintain actual networks of extremism and terrorism enjoy the luxuries of liberties through the fear and patronage of the state, says much about the scheme of the National Action Plan and the farce of ‘national security’ which is only employed against the weak, those who speak truth to power and those who put pen to paper. More recently, the parallel conference on Kashmir reportedly held by the infamous Difa-e-Pakistan Council in Islamabad while the Prime Minister chaired the All Parties Conference is also a symbolic testament to the ideological polarization and contestation for power and influence in Pakistan between the government and various hardliner groups. This reported gathering, of what was essentially a coterie of notorious individuals such as Hafiz Saeed, Maulana Sami-ul-Haq, and Ahmed Ludhianvi, was especially potent as a reminder of the government and establishment’s shaky sense of proclaimed purpose, weak will and faint dedication towards reining in “banned” groups and individuals involved in nefarious activities and agendas. 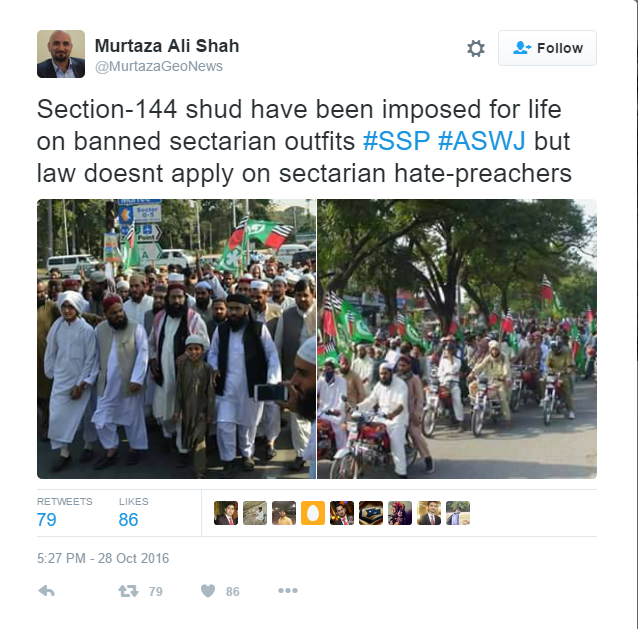 That these ‘banned’ outfits were allowed to hold a gathering while Section 144 was supposedly in application, just to curb a political party’s protests, paints an expose of the dark farce that Pakistan has come to be. Most alarmingly, the APS tragedy, which the so-called “paradigm shift” and the grand National Action Plan were predicated upon, has been the subject of a concerted and brazen campaign of silencing and harassment which has been directed at the parents of the 141 children that have been tirelessly and bravely demanding an inquiry and investigation into the ghastly attack. Who does an inquiry threaten and why? So as hopes slowly climb upon the possibility of the political and military leadership finally working in tandem against terrorist and non-state actors, it is critical to take the news with not a pinch, but a handful of salt. If they truly are serious and sincere about battling the menace of terrorism and extremism in the country, the political and military establishment can no longer proceed without dismantling existing ideological frameworks guiding state policy; the dangerous and illusory distinctions between “good” and “bad” Taliban; the selectivity of fight against terrorist and extremist outfits, and the pandering, appeasement and patronage of militant sectarian outfits and organizations like the Jamaat-ud-Dawa, Lashkar-e-Taiba, Lashkar-e-Jhangvi, which is predicated upon the logic of “assets” and useful instruments of so-called national interest and strategic advantage. To reaffirm the revival of resolve in the struggle against terrorism, the leadership of the country needs to go beyond mere political posturing, grandstanding, and lofty rhetoric. It needs to practically demonstrate change and prove it by concrete action. Until then, the eyewash shall be carried on with and the country’s current direction, which has yielded nothing but disaster domestically and internationally, shall continue to hold Pakistan and its future hostage. And we shall continue to mourn the loss of lives, cities, and the loss of Pakistan. Can the FATA Reforms Break Colonial Legacy? September 05, 2015 — In order to return to their homes from which they were forcibly displaced, the Pakistani government demanded that the people of North Waziristan sign a compulsory and non-negotiable social agreement. That contract demands their allegiance and loyalty to the Pakistani constitution and to the Frontier Crimes Regulations, the colonial era law that is still used to govern the countries Federally Administered Tribal Areas. Most crucially, the agreement entailed that should the tribes fail their responsibilities as categorized in the FCR, they will be subject to severe punishments that include cancellation of their national identity card, passport and other legal documents as well as possible confiscation or razing of their homes. While alarming, the origin of the obligations and punishments in this contract rests in a longer colonial history. In that regard, far from being unusual, it is a window into what has been the normal state of affairs for FATA since at least the British colonial era. With the FATA reforms process now underway, it is critical to examine the basic logics which have functioned in the governance of this territory. Only by analyzing them can we undo them. Essential to this analysis is the link between the long history of modern imperialism and Orientalism. As Edward Said expounded, Orientalism is a “a style of thought based upon ontological and epistemological distinction made between “the Orient” and (most of the time) ‘the Occident’.” It constructs an essential difference between the East and the West, and imagines the “Orient” as the absolute Other of the “Occident,” in the process stereotyping the customs and “minds” of the former. Some scholars have also pointed out that, in addition to Orientalist attitudes, the FCR was established in FATA because the British made a cost-benefit analysis. Scholars Sarfaraz Khan and Abdul Hamid Khan note that one of the reasons that the standard legal and administrative system that the British empire sought to institute in the rest of India was not extended to the frontier was “because of its worthlessness in the context of procuring raw material or generating revenue.” Other experts have also pointed out that, at the time, much of that territory was operating at a deficit because of low crop yields and security problems. Instead, the British developed what came to be known as “indirect governance” by co-opting local tribal elders and maliks to collaborate with colonial officials. Since 1947, there have been a number of amendments made to the FCR most of which have been insignificant in terms of substantial reform. In 1996, the people of FATA were given the right to vote. Since then, the most substantive set of amendments have been the presidential package of 2011 introduced by then president Asif Ali Zardari. It removed women, children below 16, people above 65, and entire tribes, from the clause of collective responsibility, arrest and punishment; provided appeal mechanisms and time frames for the disposal of cases; allowed for inspections of jails, and introduced provisions for bail. The amendment package also introduced checks on the powers of political agents, punishment and compensation for false prosecutions and extended the Political Parties Act 2002 to FATA. For the first time, political parties could operate in FATA. But despite these amendments, some core issues remain. Article 247 of Pakistan’s constitution, which states that FATA is to be governed by federally, invalidates the application and operation of laws made by the national parliament in FATA, unless the president intervenes and consents. It also removes FATA from the jurisdiction of Pakistani courts. The president is the ultimate authority for the creation of ordinances and the passage for amendments in FATA. Such a set-up essentially excludes FATA from the political, social and economic mainstream of Pakistan. This system of governance in FATA produced the conditions for the current quagmire. Several analysts have argued that the Pakistani state has kept FATA under the FCR for the purpose of fostering the growth of strategic assets of the state, namely Islamist fighters who can be called upon to do the bidding of the establishment. Additionally, its use as a battleground for policies of “strategic depth”, which aim to diminish Indian influence in Afghanistan, has created an environment suitable for criminals, thieves, smugglers and terrorists. Since 9/11, FATA has acquired new significance, and the political discourse has further entrenched essentialist ideas about the territory and its people. The place is still treated as “exceptional” and in a “state of war”, which bears a degree of resemblance to the colonial assumption of the frontier belt as a periphery of exceptional circumstances and conditions in need of exceptional legal-political regimes. It is the entrenched interests in FATA that have furthered this view. As Sarfraz Khan and Abdul Hamid Khan write, “those powerful having stakes in status quo, prefer [the] existing arrangement in the name of tribal autonomy and preservation of its culture.” These powerful include the political agents, other bureaucrats appointed in FATA and the maliks, all of whom enjoy a considerable degree of power, status and authority which would be diminished, if not entirely terminated, if the FCR is abolished in FATA in favor of the mainstream constitutional order. Arshad Afridi, the provincial senior vice president of the Qaumi Watan Party’s youth wing, concurs. “Maliks, MNAs [member of national assembly] and bureaucrats in the FATA Secretariat are the ones propagating that the people of FATA want FCR to be retained because it has empowered them. [The] MNA brings a political agent of their choice and they collectively rule the agency. Maliks are the so-called elders who misuse their power in jirgas.” Afridi also adds that apart from the legal power vested in these groups under the existing framework of the FCR, these people also thrive through the illegal activities available in FATA. The retention of an anachronistic colonial instrument like the FCR was condemned by the late Chief Justice of the Supreme Court Justice Alvin Robert Cornelius as “obnoxious to all recognised modern principles governing the dispensation of justice”. The people of FATA are still bound by a colonial set of relations, barred from the share of any political, social or economic development and participation in the rest of the country; dehumanized and virtually treated as second-class citizens. And while Pakistan’s use of the FCR may be informed by the post-colonial state’s own dispositions and distinct reasons, in that they differ from the exact imperial calculations of the British in implementing the FCR, but for the people of FATA the post-colonial has only been a continuity of the colonial. It is clear that the FATA reforms will only be successful if they can constitute a break from this lingering colonial continuity and its relics. “There is no such thing as an illegitimate human being” [On the issue of infants and children being abandoned because they are illegitimate]. No matter how worse things took a turn for in Pakistan, Abdul Sattar Edhi was one individual, one icon, one saint who gave me, and all, strength and hope. Hope, that there is good in Pakistan, that there is good in this world. 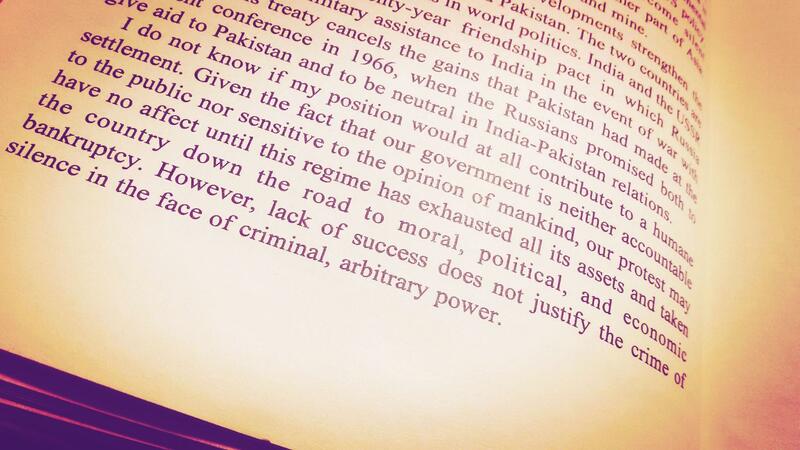 And strength, that in him resided the embodiment of all that Pakistan could be. The best Pakistan could be. I saw in him the Muslim I wish to be, the human I wanted to be. I saw in him the magnificent beauty and purity of humanity. I knew for every Mumtaz Qadri, there was Edhi. For every Malik Ishaq, there was Edhi. There was never need for another human being, for he was enough. He was no man, he was an institution. As we writhed in the pain of our wounds, he healed us. But he was no hope for the helpless, the beggared, the oppressed, the lowest of the lowest. For the poor laying on the footpaths in the scorching heat, for the beggar limping his way amid traffic, for the infant abandoned for no crime but his birth, for the addicts ostracized, for the victims of a cruel society and an apathetic state -for those who had no one – he was there, he was their everything. He had no education, no riches but he was their food, their clothes, their shelter, their parents, their dignity; their salvation sent from God. He was Pakistan’s soul and heart, a soul and heart unblemished by hate and division. A heart and soul that did nothing but give kindness and love; and that gave generously and selflessly. 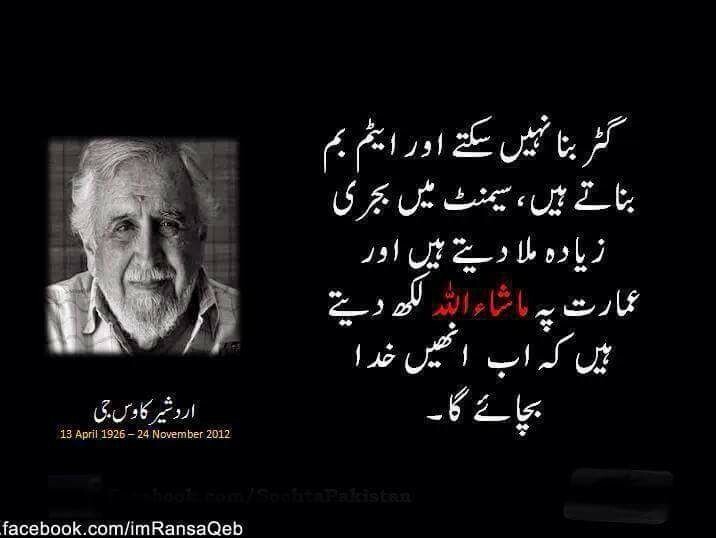 He was one of the greatest Pakistanis, if not the greatest alone. And certainly one of the greatest human beings. To walk the same land as Edhi, what an honor it has been. To breathe the same air as Edhi, what a privilege it has been. Pakistan is infinitely poorer today. Pakistan is orphaned today. God knows how this void will ever fill, how this void will ever heal. More than ever, it was today, at this moment in time marked by bigotry, distrust and hate that we needed Edhi Sb’s unblemished humanity and love, his unparalleled courage, his matchless integrity and honesty, his radiant humility and dignity, and his towering principles. 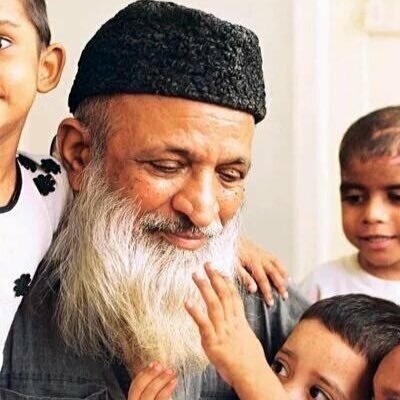 We needed Edhi now, desperately, but we also needed him forever. As per his wishes, his healthy organs will be donated. Even in death, he has given, he has helped. He has served right till the end, and beyond. The only befitting tribute to him would be our realization of the humanity he espoused and practiced; a humanity higher than the petty matters of race, ethnicity, class, gender, religion, sect, politics and prejudice. A humanity higher than the flimsy divisions we have constructed between ourselves; on maps, in borders, in our minds and in our hearts. There is no better tribute to him that our espousal of his principles and his ideals; it is no tribute, it is a duty and a responsibility owed to a man to whom we will forever be indebted. Raise your voice, stand up, work and act for a tolerant, humane and peaceful Pakistan and world. For if only we would all strive for even a speck of the incredible humanity he personified and possessed, Pakistan would be a much better place. Let our actions, not our fortune, lay claim to Abdul Sattar Edhi and his life. Let us be his legacy. Let us mourn but let us also honor him. Let us be his legacy, in words, actions, in life and in spirit. Thank you and farewell messenger of humanity, farewell Edhi Sahab. I do not wish to write about anything other than the great man and the great loss we have been faced with today, but I find it difficult to sidestep the growing set of comments condemning the Nobel Peace Prize in wake of Edhi Sb’s demise. You are doing no service to Edhi by reducing his life & work to the trifling recognition of a prize he never sought; he sought nothing. Edhi was in no need of any prize or recognition, and especially not validation. If you want to recognize him, carry the spirit of his work forward. Do not reduce the man and his legacy to some prize or reward, he was above all of these. Do not project the smallness of our minds and hearts onto the greatness of the man. Do not dishonor him like this, please. Let us not forget the role Dr. Adeeb Rizvi and SIUT have played in caring for Edhi. Dr. Rizvi is a man in the same league as Edhi’s, he is an incredible human being, an institution and a living legend. A pity he isn’t known much (although known very well to those who threaten him) but he has been aptly called “Pakistan’s Miracle Doctor” and has saved thousands of lives while ushering in a new era for Pakistan’s healthcare system with SIUT. “But one public sector hospital in Karachi provides free specialised healthcare to millions, led by a man whose dream was inspired by the UK’s National Health Service. Now the hospital says it has the distinction of performing the highest number of successful renal transplants, dialysis sessions and treatment of kidney stone disease anywhere in the world. I don’t have anything profound to say because there is nothing more profound, more jarring than loss. Kuch kehne ko alfaaz nahi, jab na insaan na koi awaz rahi. Seeing the news, my 15 year-old brother asked me yesterday who was Amjad Sabri? So wrote Ray Bradbury in Fahrenheit 451. Since I’ve read it, it has made me think of my friend Bassem Sabry. It has made me think of Sabeen. It has made me think of those no longer among us. And of the many taken from us. 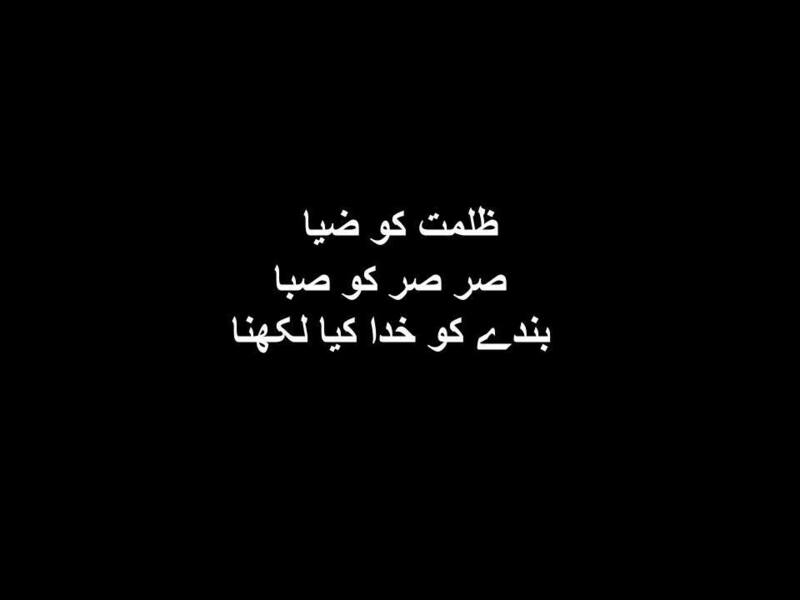 And yesterday, it made me think of Amjad Sabri. Knowing never again would we hear the majesty of his voice, the magic, the tradition, the feeling, the beauty. Knowing that there will be many who won’t know him after this, whose souls will be starved from the stirring that he alone evoked; their hearts hollow from being unmoved. Knowing he would never again sing. Knowing the many messages of love, peace and harmony he will never again recite. Knowing all the melodies, rhymes, and rhythms that his voice will never touch, they will never come to be for he is no longer there. From Sabeen Mahmud to Amjad Sabri, to all in between and before, this is true. Kaise bharain gay yeh zakhm, kaise bharay gi yeh khalah? Kaun wapas la sakay ga baap ki shafqat un bachon kay saro’on par? We are poorer today than we were yesterday. This is a poverty of permanence. No amount of riches, no degree of progress can ever paper over this poverty; a poverty of culture, of art, of tradition, of heritage, a poverty of humanity. He will never really know. Every political item yesterday in the news bulletin infuriated me. All these “leaders” & “governments”, the whole circus, making a joke out of Pakistan as we keep losing our best. The creators, healers, musicians, artists. Our assets, our traditions, our institutions. Shadeed muzamat. Afsos ka izhar. Tehkikaat ka hukm jari. Their apathy, their indifference, their incompetence – Pakistan pays for those every single day. In blood. They keep engaging in their political manoeuvres and gimmicks while Pakistan continually bleeds in a pool of its own blood. But it’s not just them, it is us. My mother remarked in wake of the attack, kay mulk kay aise halaat kay dauran kuch bolna hi nahi chahiye. I disagreed, akhir Amjad Sabri ka kia qasoor tha? What was it that he spoke to have had his life cut short? Iss mulk kay halaat satar saal se aise hi hain, kitni daer tak bayawaz bethay gay ham? Zinda hain kay murda hai ham? Kyun koi nikalta nahi? Kyun koi manta nahi kay iss zulm ka aik chehra aur soch hai? Kyun bhool jatay hain ham? When you’re politically correct and resort to meaningless euphemisms, you call the confused, callous, compromised and complicit majority a ‘silent majority’. You, yes you, are complicit. 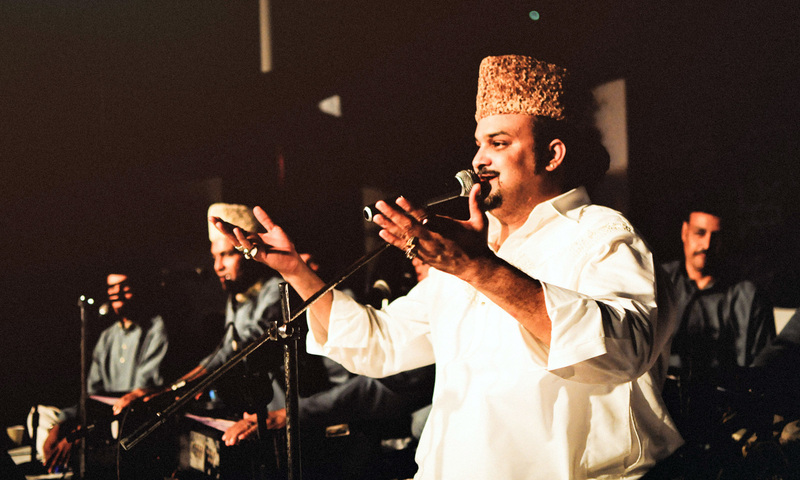 Amjad Sabri kee zindagi kay baab kay sath Qawwali ka aik sunhera baab hamesha kay liye band hogaya. Iss mulk main kitne aur baab band hon’gay? Umeed aur insaaniat kay baab tau kab kay band ho chukay. Kab hoga iss zulm ka baab khatam? Alfaaz nahi iss sanehay se mutaliq. Jis mulk main kuch reh hi na jaye zulm kay ilawa, kuch kehne ko baqi kia reh jata hai. No other voice today can describe the irreparable void we’ve been left with, except his own. Rest in peace, Amjad Sabri. P.S: Please have some sense of respect and decency in this moment of grief. There is nothing in sharing or viewing graphic images, except perhaps the gratification of some twisted and sick voyeurism. Think of a loved one in such a position. None of us ever wants to be seen in any state or condition we consider unfavorable or bad, let us not do that to a man who can no longer control it and whose last moments were marked by violence. Kissi kay dardnaak lamhe aur halat ko tamashai ban kar dekhna aik beyhuuda, bayhiss aur bayreham amal hai. This was a man who gave us much joy and brought us much pride. Show him respect, let him be remembered in all his might and glory, and please remember him as that. *First posted on The Nation’s Blog. “Why is Ahmadi such a taboo word? Ideological stances aside, my only goal is that when an Ahmadi is killed or persecuted, the media shouldn’t be scared to talk about it,” he had said. It seemed too good to be true. A conversation about a pressing issue being initiated by a prominent TV actor with a large fan-following on national television during Ramzan. A few days back, a video emerged of Hamza Ali Abbasi hosting a channel’s Ramzan transmission in which he questioned the seated Islamic scholars whether the state has any right to define who is and isn’t a Muslim, and if the state has the right to declare Ahmadis non-Muslims. He further elaborated his intention to host an entire programme on the Ahmadis and the controversial Blasphemy Laws in Pakistan. Hamza was treading on dangerous ground, one which is bloodied with risk and loss. The absence of any action on part of the government concerning what is an unambiguous signal for murder also indicates the level of its commitment in combatting extremism and safeguarding the lives of its citizens. But even more indicative is perhaps the possibility that either the government agrees with Noorani’s ideology or that it does not have the courage to take action against the expression of a belief, that those who speak of the Ahmadi issue and Blasphemy Law should be killed, which has a great deal of currency and supporters in the society. But on a more immediate level, what should’ve been an active and responsible response by both PEMRA and other government authorities in light of the call for cold-blooded murder issued on national TV, resulted instead in PEMRA issuing a ban on both the programmes: of the targeted and the perpetrator; thereby essentially equating a discussion on an issue with incitement to murder. In issuing the ban, it stated: “During these transmissions, ratings remain the focus under the guise of Ramazan shows,” read the Pemra statement, adding that “provocative conversations took place during the shows which has led to much anger”. “Even after clear instructions from Pemra, unfortunately TV channel owners, anchors and audience indulged in non-serious and irresponsible conversations,” added the statement. It is rather curious that the objection of “non-serious and irresponsible conversations” was not invoked in the case of the majority of shows dominating channels in Ramzan which shamelessly make a vulgar mockery and joke of the month. But this is also says volumes about our observation of Ramzan and the hypocrisy, which PEMRA’s decision reeks of, when televised circuses pass for popular Ramzan transmission programmes and a show attempting to go against this norm by broaching serious issues, with a clear set of risks attached to it, is dismissed as “provocative” in the pursuit of “ratings”. PEMRA is not new to this exercise of farce and regressive thought. Only recently did it announce and later revoke a ban on contraceptives’ and family planning advertisements. This was followed by its decision to issue notice to Udaari regarding its portrayal of child abuse in the drama. What is common in this string of actions and decisions by PEMRA, apart from the absurdity of it all, is the idea of silence and denial that the Pakistani society and state thrives on. What exactly is being prevented by these bans? How flimsy and weak are the foundations and ideas of this society and state which are shaken and threatened by mere discussions and simple questions? Hamza Ali Abbasi’s discussion sought to question and address the difficulties, the discrimination and the plight of the Ahmadi community in Pakistan which is sanctioned constitutionally and imposed stringently by many of its citizens socially and culturally. 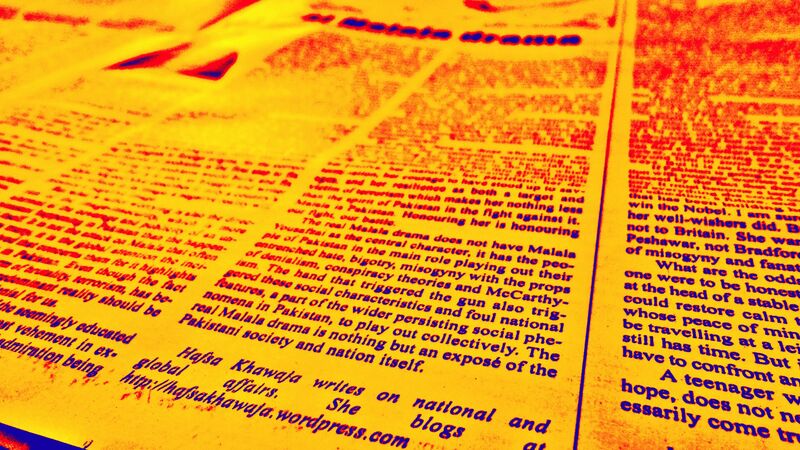 PEMRA’s ban, however, serves to preserve the state’s monopoly of narrative on the issue. This is the same monopoly that has under its grip issues ranging from the Second Amendment to Balochistan. These are narratives hailed as the truth; narratives that are dominant through years of indoctrination and imposition yet still weak to be confronted by mere question and inquiry. A question and inquiry which seeks to establish that a people have the right not to be killed irrespective of their beliefs and one’s own agreement or disagreement with those. But let alone raising voice in this regard, even the right of that voice is denied to us. 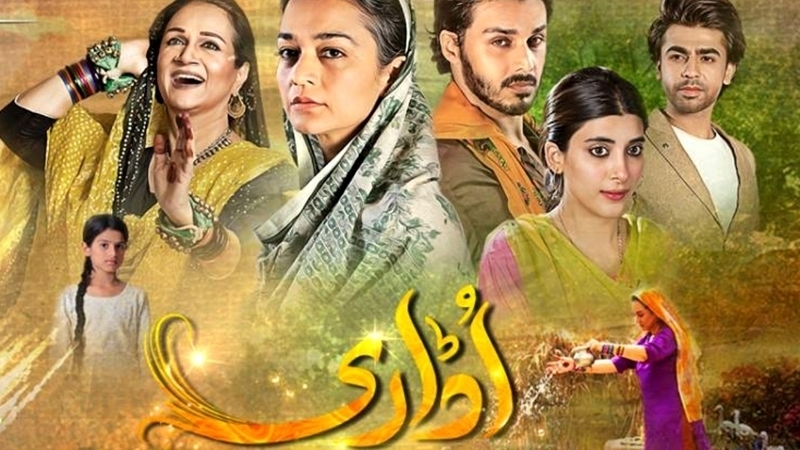 The recent notice to Udaari demonstrates the same, but not with regards to state narrative but a cultural and social narrative. The portrayal of child abuse is a cause of discomfort for many, who would rather indulge in their ignorance and indifference to the ghastly acts that are committed every single day against children. It is ridiculous that the depiction of a problem offends and hurts the sensitivities and sensibilities of people more than the realization that this depiction is an everyday reality in Pakistan hurting, harming and destroying hundreds of children and their lives. This is denial. What message are our dramas giving to the public by showing a 10 year old girl raped by her step father? They are giving a message of awareness, of consciousness, of cautiousness, and yes, of disgust, because this does happen in Pakistan. It is not a remote reality or a figment of dramatic imagination. And what message are we giving by calling these efforts “pathetic”? That the plight of abused children in Pakistan is trivial, irrelevant, worthless; that their plight is pathetic for denial, for us, is divine. Perhaps this is why debates and discussions in Pakistan are seldom ever more than ugly degenerations into polarized demagoguery, tub-thumbing and crass behaviour, such as one witnessed by Marvi Sirmed recently, because we are not familiar with the practice and norm of civilized discussion, debate and disagreement conducive to the healthy development of a society and nation. We conveniently cling onto silence, denial, dogma and indifference, for they do not offer us the discomfort reality in this country entails. We would rather ignore than cure the plagues and problems Pakistan and many Pakistanis, other than ourselves, face. What Pakistan needs today is awareness and tolerance, the starting point of which is respecting and engaging differing points of view, opinions, questions and discussions. But for that to happen, there needs to be a basic ability to listen and to learn; an ability which clearly doesn’t exist if the answer to a question and the response to a discussion are death threats and bans.